I was surprised this morning as I clicked on the usccb website to find that the first reading for this “ordinary” Monday was the beginning of the Book of Genesis (1:1-19). I expect that text at the Easter Vigil when the Church is all dark and a powerful voice (if we’re lucky) booms out: “IN THE BEGINNING…” and we wait for each day of creation, able to visualize the appearance of light and sky and dry land and vegetation and stars…and everything that we know about our universe. It is a glorious experience each year! I don’t remember ever seeing that text on an ordinary day – and actually, this morning it only goes as far as day four. Happily that included the sun, moon and stars, some of my favorites of God’s gifts. I wonder what message I can take on this day when I will be working at home rather than at my office. What will I create today? Certainly nothing so vast as the universe! Will it be the day that I take another slip of my prayer plant to start it growing in someone else’s life? Maybe I’m just supposed to listen today to see what the world brings to me. Might I just walk more lightly or eat more consciously or read some amazing sentence that takes my breath away? Today feels like “the day the earth stood still” (which I believe was a movie many years ago that I have no memory of except the title). I sensed that as I awoke to rain and darkness this morning, still holding the events of yesterday and last evening in my heart. I am on retreat and our Good Friday “Entombment Service” was a stark example of the kind of experience I was describing here yesterday. The reading of the Passion from Mark’s gospel in sections of the day (6AM-9AM, 9AM-Noon, etc. ), the mournful chanting and the wrapping of the crucifix in the linen cloths as it lay on a table in the middle of the room brought the experience of Jesus’ death present in a most vivid way. It was clear in the slow, personal moments of each one of us moving to venerate the cross that we were grieving. And we will hold that attitude as we move through this last day together. The mood will change in tonight’s first celebration of The Great Feast of Easter, the Vigil service recounting the movement from death to life. The first psalm of the service cries out: Lord, send out your Spirit and renew the face of the earth! What follows is the narration of our salvation history during which the sense of the light grows and hope returns until the bells ring out and we know Resurrection! Alleluia! Living in the present moment is especially hard today. It would be much easier to focus on the future as we often do in the times when we would rather be there than in the moment where we find ourselves. But today gives us an opportunity to join ourselves to those people who are waiting for a good outcome of suffering, those who have no assurance that “all will be well” – nothing except their faith to keep them from despair. 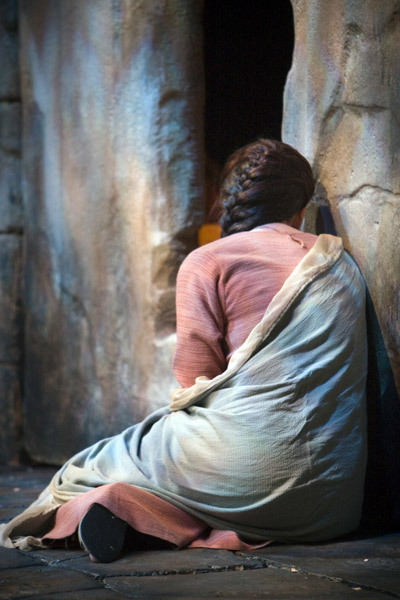 Here we will explore today the experience of “Mary Magdalene and the other Mary” whom the gospel tells us stayed at the tomb, without hope or reason to do so – just holding the space in reverence and fidelity to Jesus – as love calls us to do in times of great sorrow. We will wait in that “desert” with them, a time that will make all the more joyful our experience of the Resurrection of Christ and perhaps our own rising to fuller life as well. May it be so with you! PS: I leave early tomorrow morning for a week-long Wisdom School experience with Cynthia Bourgeault in the mountains of North Carolina. I can’t be sure of internet service there but will connect as I am able, definitely back by Monday 4/13.